I recently reached a goal on Ko-Fi and came upon a windfall post-tax season such that I could justify remaking Velvet's wig for Tekko! Thank you for your support!! 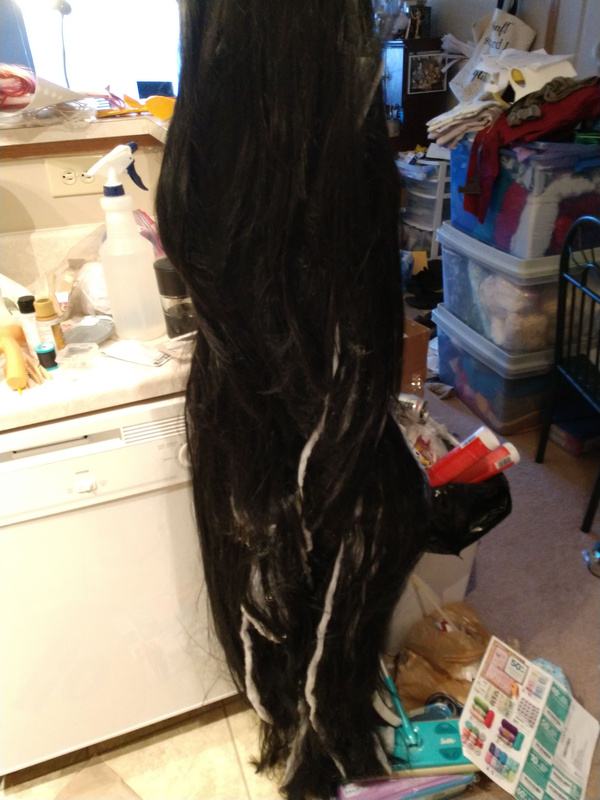 Because I've already given a costume writeup for Velvet, this will show you what my process has been for the wig remake. Warning: If you're seriously considering replicating this wig, please understand that it is HEAVY. I wore it for around 10 hours during the trial at a con before it became too much. I recommend pin-curling or French braiding any hair you have, using a netted wig cap, hair pins AND bobbi pins, and a velvet headband (with nap facing outward so that the wig catches properly) to distribute weight across your entire head. Stretch your neck, shoulders, core, and legs prior to wearing. Also, if you can take a painkiller beforehand, do so. I wore the wig ONLY at the convention and not during my commute to the con. If you're able to carry your wig to the location of your shoot and put it on there, that's the best option. Keep it safe in large plastic bags and attached to a wig head. Now that that's been stated, on to the fun part! I started by studying references. The animators paid great attention to Velvet's hair, even using it in parts of the main plot, so I wanted to make it accurate but also beautiful. If you observe the braid in the back, she has three main sections that cross twice, along with tendrils and added parts. Her bangs are more voluminous than a normal wig's bang allowance. With this in mind, I sketched out the general shape of each piece of the braid. When you do this, don't include the bottom free-hanging part that comes out of the tie. We'll account for that with free-hanging fibers. Once I had a better idea of how the shapes fit together, I made a mockup. I anchored my wig head so its top was mere inches below my natural height. Then, I pinned the batting near the top of the wig head and spread it on the counter space so it made almost a sheet. 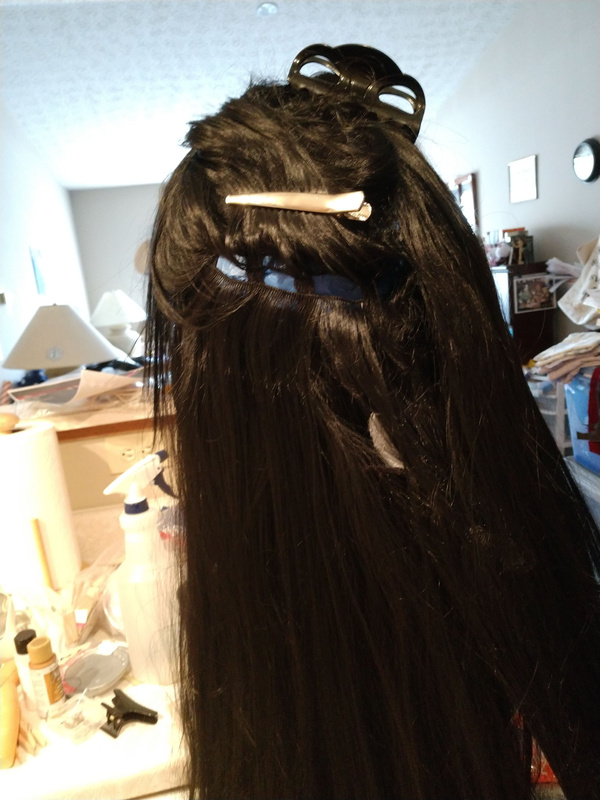 While I put the wig I wanted to use on the wig head, you don't have to; I wanted to make sure I could identify weft parting locations, but that's optional. With my reference both in hand and taped beside the mockup, I sketched out locations of the braid sections. I used a tape measure to approximate where each braid should cross. However, if you have a height scaling tool, you may find you have an easier time sketching it out using those results. (I'm a notorious eyeballer.) I made sure to note the locations of the "strands" (the pieces that come away from the hair and enter back in another part of the braid). The first step working with the wig base was to separate and straighten the wig. I had bought a Luthien, which has varying lengths of curls up to 40". I recommend using this type of wig for a few reasons: it has the length and layers you need to disguise the weft placement, it has ample room for bang styling, and it doesn't tangle as easily as the Delilah. I separated the bang section out so that it was just under equal hemispheres, and then I tied it and put a clip over the section as to not confuse it with the rest of the hair. Once again, I pinned the batting in place and braided it to spec. This is the last chance you'll have to truly edit the shape. 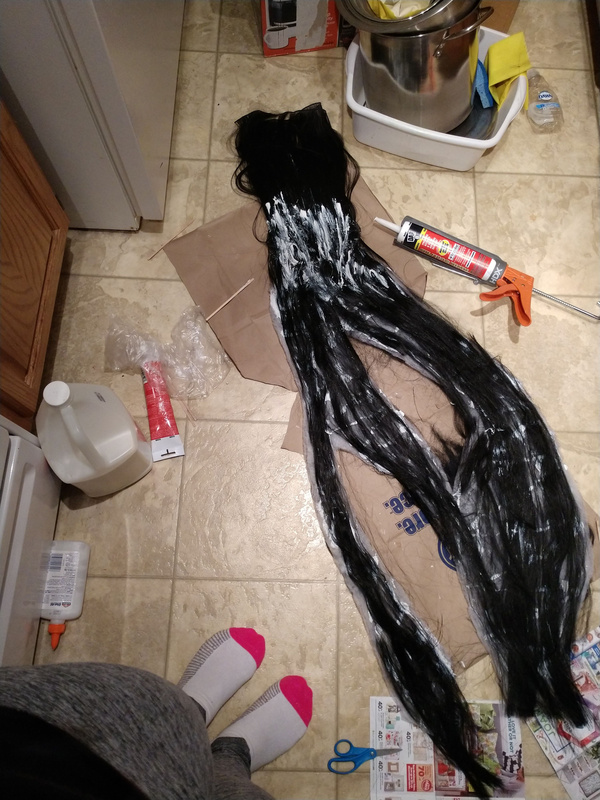 Once satisfied, I put down some brown paper bags and plastic bags, untangled and spread out all my wefts and jumbo braids, and began caulking. You'll want to caulk in vertical and horizontal criss-cross lines and spread out the caulk as best you can before laying down the wefts. This is easier if one person does the caulking and another person does the laying of wefts. But it's lonely for me in Titania, so I made quite a mess. Be sure to wear protective gloves and keep your space as clean as possible. Take your time and really cover those batting pieces, front and back and sides. I wish I had ordered six packs of the I-Kick-Shins braids, if I'm honest, as they added volume cheaply and efficiently. You will probably need to cut up some pieces into shorter ones to fill all the gaps, and that's okay. Sectioning off with those little clear elastic ties makes it a cleaner process. Allow at least 24 hours for your caulked pieces to dry. (Ideally, you'd give it a week or so. I was not ideal.) Look for any gaps and fill them with more fiber before you consider attaching the batting. When it came to attaching the batting, I planned an allowance at the top to caulk a few rows of short wefts that would become sewn in as an anchor. 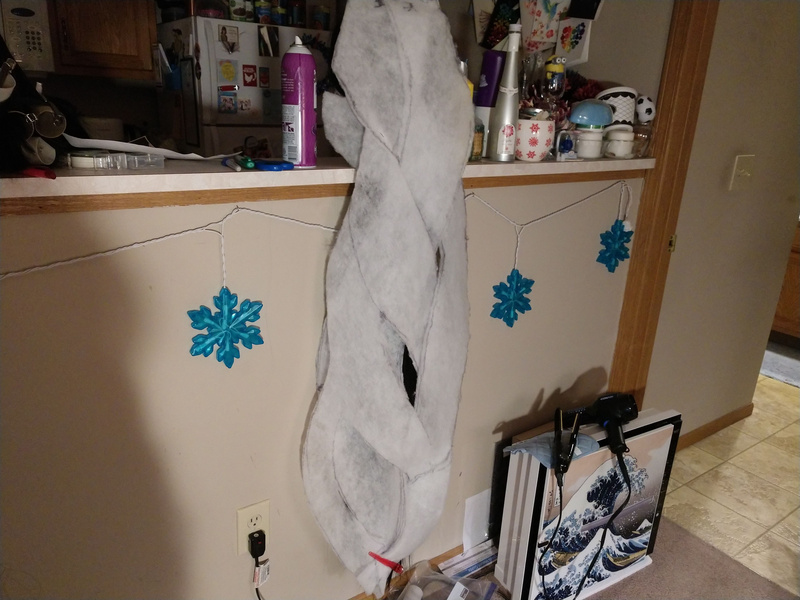 I totally measured (guesstimated) the allowance and caulked the short wefts on at the top, spreading caulk over ALL the fibers at the place they overlapped, as well as underneath the weft. Let that dry for an additional 24 hours. While I waited for the caulk to dry, I started taking apart the Delilah. 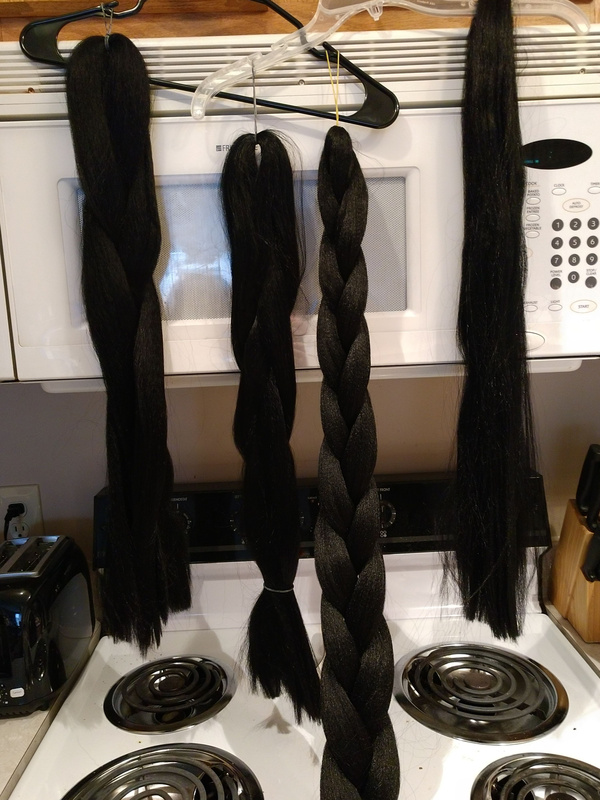 I was going to use these harvested wefts to cover whatever jumbo braid didn't look realistic enough on the sides and front of the braid pieces. Note: long wigs are extremely difficult to detangle and harvest successfully. As such, I ended up cutting, not seam-ripping, sections of the elastic and wefts out. My carpeted floor will never be the same. 0/10 would not recommend. 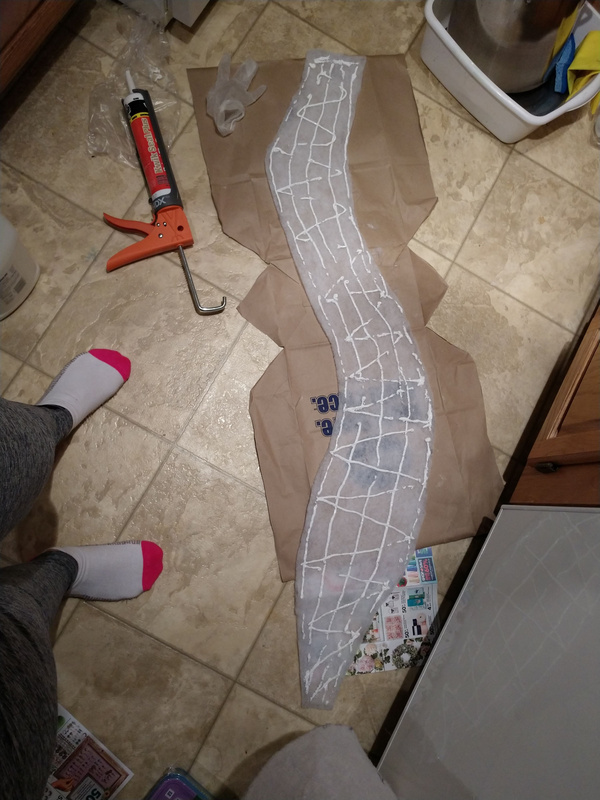 The next step is to attach the finished caulked batting, start at the bottom and work your way up, clipping the pieces that go on top of the caulked section with alligator or bill clips. Allow a couple rows of the existing bottom wig wefts to float underneath your bottom-most batting piece. This will be help you be able to detangle and straighten the part of the wig that hits your body/coat. Sew the batting in using a curved needle and sturdy button thread. 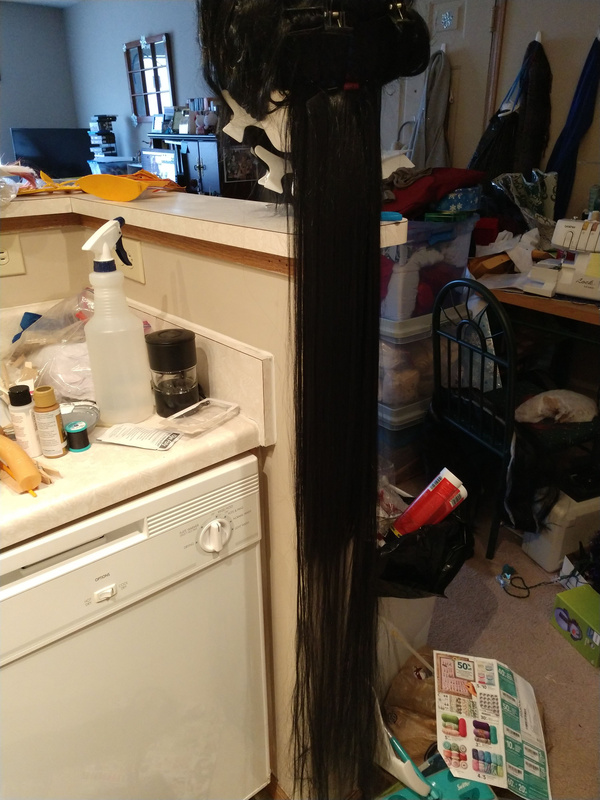 This is why it's essential to have a wig head sized to your head: if you sew your batting into a wig that's sized too small for your head, it will not fit you when you're at the stage where you can try it on and you'll have to backtrack or scrap the project. SIZED WIG HEAD. 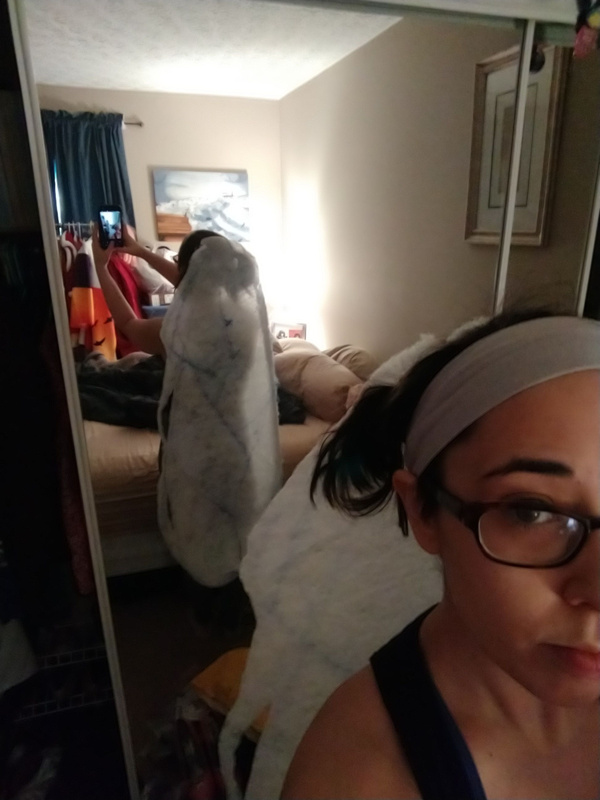 It would help to have a friend hold the batting up while you sew, but if you're in Titania, something like the back of a chair or the stacked bodies of your enemies will help hold the batting up so it isn't pulling down on the wig's elastic too much. When you're at the stage where everything has been sewn in, braid the hair into its final style. There will be wig fibers that don't connect with the batting on various levels. That's okay--let them be for now. Again starting with the lowest layers and working your way up, adjust any wig fibers that were misplaced or need to be added. I had quite a few bald spots on mine, but hopefully you won't. 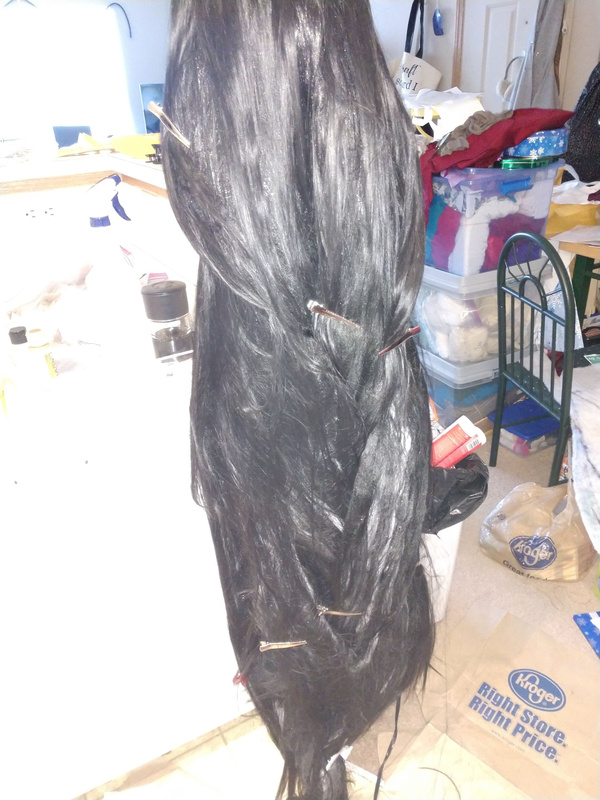 This simply meant I was sewing more of my harvested Delilah wefts onto the sides and bottom of the pieces. You can use a mixture of sewing and caulking to fix bald spots. 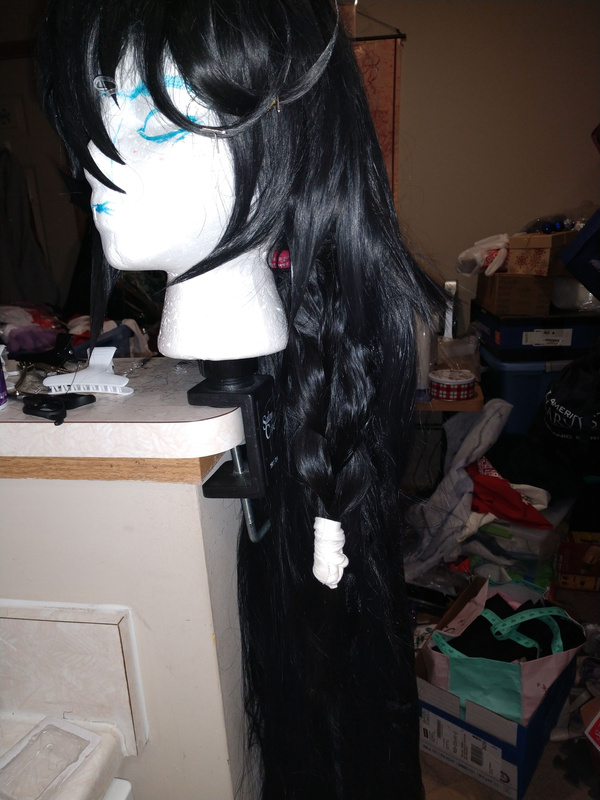 The same goes for the hair from the base wig--sew or caulk it into place with the direction of the braids. The Luthien is very forgiving for Velvet's style. Your base wig should end fairly naturally along with the folds in braids 1 and 2. Go slowly. Take pictures and compare to your references. Feel like you're screwing up anyway. Eat a snack. Try again. Say out loud "good enough" and magically your wig will look good enough. Copious hair spray (especially Got2B) over the whole braid, in conjunction with a hair dryer. Copious sheen spray (like Motions) underneath on the free-floating base wig fibers. Find a way to tie, sew, or glue the bottom edges of your wig together and prepare for the "tail" end. If you're taller than probably 4'10" or so, you'll definitely need to use some more of your short wefts to create that length. It doesn't matter how you attach it (glue or sew)--this part will be covered with the wrap. I used stretch fabric because it doesn't fray and it matches my arm bandage glove, but you can use almost whatever you like. (Please don't use sticky athletic tape, though.) I then sewed (but you can glue) the fabric to the wig so that it appeared like the reference and stayed in place. Now, the bangs. I like to make my bangs accurate to a 3d model and spike 'em out with volume. That might not be your style. Use whatever method you'd like to cut the bangs. This would be a good time to double check the fit of the braid and section out the bang pieces if you haven't already. The last piece is the braid that falls over Velvet's left shoulder. I had a legacy set of wefts from my V1 build that I'd simply seamripped out and cleaned up a little. I attached the bandage the exact same way I did for the bottom of the braid, being careful of where the seam/ends of the bandages go. To create the flared effect of the volume she's got, you can pinch and carefully pull out the edges of the braid where you want volume. 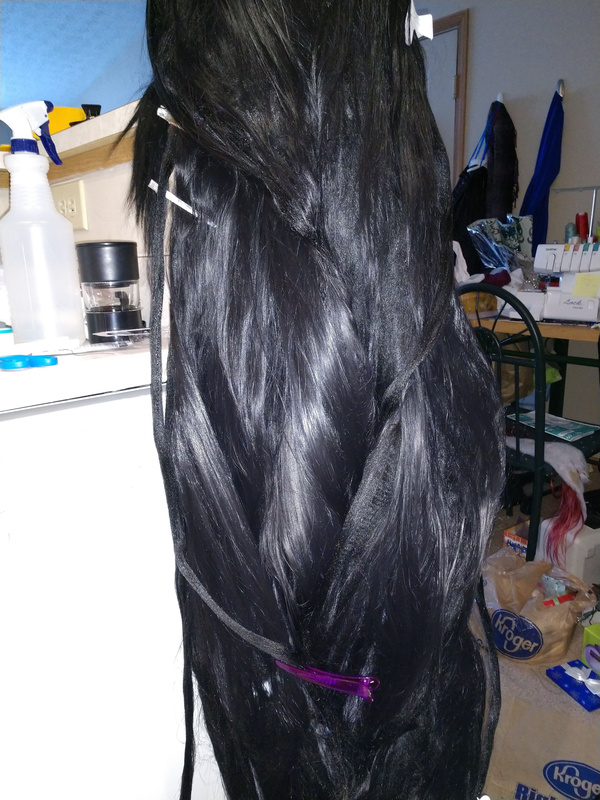 For my version, I made the braid a clip-on attachment (by backing with black felt and hand sewing the clips with button fabric) because I may want to use this wig for other outfits where she might not have a braid. For your version, you may want to sew it directly between the wefts of your base wig. Voila! Enjoy your Velvet wig! Please take the aforementioned precautions when wearing this wig. It's heavy! Thanks for reading. Let me know if you use this as a guide to build your Velvet wig and show me the results. Heck, let's just talk about Velvet Crowe, wig or not! She's my favorite character from anything, ever, so I'm really happy you're looking into how I made her wig!